The original twist focusing classic from LED Lenser. Simply twist the head to focus the integrated Advanced Focus System optics into a flawless flood beam (near) or intense spot beam (distance). 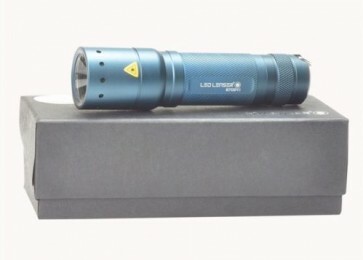 The tactical styling of this torch with its diamond design knurling on the barrel and straighter, more defined head shape results in a large grip area that is welcomed by professionals on the move such as Police and other Emergency Teams as well as handymen - professionals and armature alike. Superior materials such as aircraft-grade aluminium housing and gold-plated contacts ensure that this rugged torch won't let anybody down. The Police Tech Focus can deliver a fantastic 115 lumens and on the low beam option, still bright enough for most everyday tasks, will run for around 50 hours off its 3 AAA batteries (supplied). Features: Medium sized classic twist-focus tactical styled torch that is an essential for utility belt or toolbox. Energy efficient CREE Power LED Light Chip. State-of-the-art, reliable German engineering. Advanced Focus System™ Optics. Classic twist focus. Dynamic Switch ™. Robust, yet lightweight aircraft-grade aluminium housing. User-friendly modular design. Corrosion resistant gold plated contacts for better conductivity. Superior rear tail cap switch. Water and dust resistant to IPX54. Technical Information: Size: 126 x 32mmØ. Power: 115 lumens max. Run Time: up to 52 hours. Beam Distance: up to 220m. Weight: 144 grams. Supplied with: Wrist-strap, belt/storage pouch and Duracell® batteries (4xAA).